We’re huge fans of pint-sized bowling sets because they encourage active play and can be used indoors or out. From adorable kitties to penguins to traditional, we’ve showcased many a fantastic bowling game on Inhabitots, but none quite so Wonderland inspired as this pretty Mushroom Bowling set. 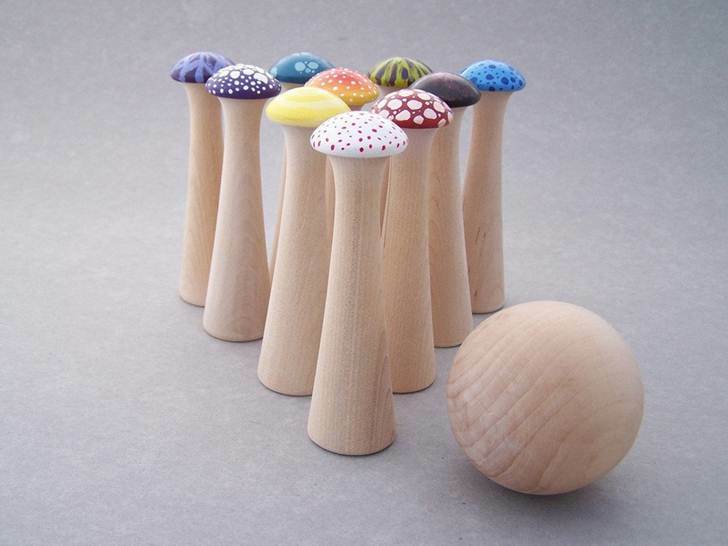 Handmade in small batches, this set includes ten towering toadstools ready to take a tumble. It’s perfect for a garden party game or to keep your little one active and occupied. Each set is made of solid wood, carefully sanded to a smooth finish — and each and will be slightly different due to the hand painting and color mixing process. The entire set, including a ball, comes in a cotton bag for easy storage. We're huge fans of pint-sized bowling sets because they encourage active play and can be used indoors or out. From adorable kitties to penguins to traditional, we've showcased many a fantastic bowling game on Inhabitots, but none quite so Wonderland inspired as this pretty Mushroom Bowling set. 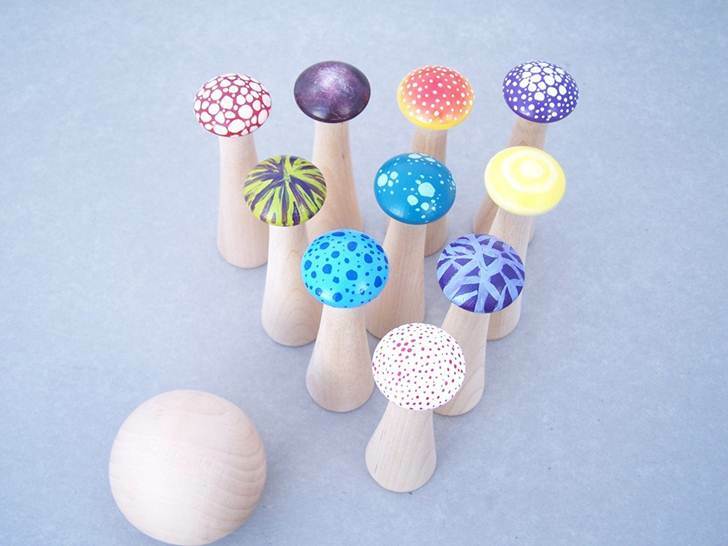 Handmade in small batches, this set includes ten towering toadstools ready to take a tumble. It's perfect for a garden party game or to keep your little one active and occupied. Each set is made of solid wood, carefully sanded to a smooth finish -- and each and will be slightly different due to the hand painting and color mixing process. The entire set, including a ball, comes in a cotton bag for easy storage.